Venezuela’s Attorney General, Tarek William Saab, told a socialist government television program Thursday night that the situation within the Helicoide was a “row” among non-political prisoners, and that their claims of torture and abuse were false. He also claimed the Sebin had removed 72 prisoners from the facility and moved them elsewhere to diffuse tensions in the area. The Helicoide prison holds 54 of the nation’s 338 known political prisoners, according to NGOs active in the country. At least 20 of those have received a legal clearance to leave the facility but remain imprisoned. Friends and relatives of those imprisoned at the Helicoide began gathering outside of the Caracas building on Wednesday, when prisoners within began using social media to post videos of themselves having escaped their cells and overrun the prison. Among the political prisoners were prominent leaders like former San Cristóbal mayor Daniel Ceballos and longtime anti-socialist General Ángel Vivas. Joshua Holt, an American imprisoned in Venezuela on false charges of weapons hoarding, joined the prisoners in demanding their own release and respect for human rights. Saab appeared on the youth-oriented government program Zurda Konducta (“Leftizt Kondukt”) Thursday night wearing a Bob Dylan T-shirt and, as is typical on the program, speaking over loud American-style rock music. The program’s host cites the case of Joshua Holt, and claims that Holt was never in danger, but rather was caught in the crossfire of a dispute over a theft between two common prisoners. Saab appears to corroborate this. “What happened was a row that happened between common prisoners, that is the reality.” He denied regular reports of the torture of Joshua Holt – whose attorneys say has been subjected to torture and ridicule due to his membership in the Church of Jesus Christ of Latter-Day Saints – instead claiming Holt got himself into a prison fight. “The boy was never tortured, he was beaten by another inmate,” Saab claimed. Saab also denied that the political prisoners ever took control of the Helicoide. Saab added that 72 of the prisoners at the facility were transferred elsewhere, without elaborating. Using his and others’ social media accounts, Holt, who has been in prison without a trial for two years, warned in videos that “people are trying to break in my room and kill me.” He clarified in a video standing with Ceballos and other dissidents that the political prisoners were not threatening him, but rather the government, and pleaded with the Trump administration to release him. “We demand the government give us access to Joshua Holt and other American prisoners today,” the American embassy in Venezuela said in a statement Friday. The relatives of those imprisoned at the Sebin headquarters have not yet been told who was transferred out overnight, how many of them there are, or where they went. Many of the parents of those prisoners remain congregated outside El Helicoide demanding to see their loved ones. Joining them are representatives of the Colombian government and the Catholic Church, which has become one of the most consistent voices against the socialist regime of Nicolás Maduro in the country. 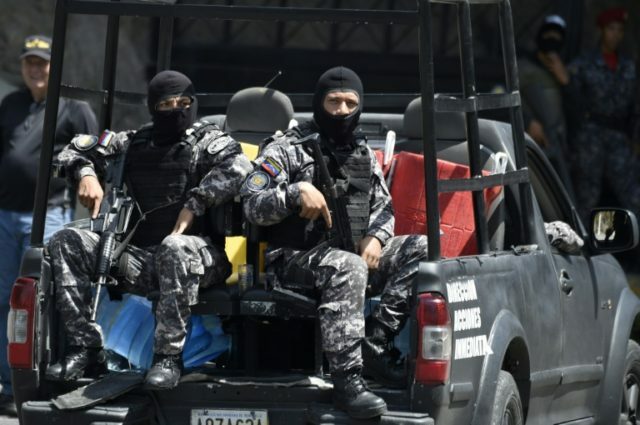 The Venezuelan Penal Forum, an NGO that works to track politically motivated arrested and human rights abuses in the country, stated on Friday that they had no evidence that any prisoners had been transferred out at all. Yet one political prisoner still at El Helicoide, Villca Fernández, published a video stating that 68 people had been transferred out of the facility. “We achieved the freedom of four minors,” Fernández declared, adding that the 68 removed had long ago received judicial approval to leave the prison. “We are still struggling and demanding freedom for all political prisoners, we continue to demand respect for the human rights of all prisoners, we continue struggling and are grateful to all who have battled with us in the past few days, the Catholic Church, the international community, our relatives,” Fernández concludes. Fernández adds that Sebin agents have taken over the prison once again and are engaging in an individual review of every prisoner, which he hopes will lead to some receiving much-needed medical attention. The incident at the Helicoide began on Wednesday. According to reports citing multiple prisoners within the facility, the political prisoners left their cells and managed to force the Sebin agents out of part of the prison without using violence following the beating of political prisoner Gregory Sanabria at the hands of common prisoners, which some of the political prisoners claimed were being paid by government agents. According to the relative of one of the political prisoners who spoke to the BBC, fellow prisoners of conscience “came out to defend him” and refused to go back into their cells. Nicolás Maduro has not commented on the ongoing situation at the prison at press time.